CERT VEST Only:Includes our World Prep CERT Vest ONLY. 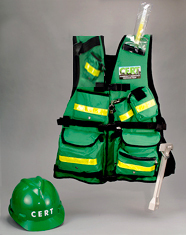 World Prep®, a leading supplier of CERT equipment, has developed the CERT Vest. Based upon hands-on CERT training, this vest has been developed to provide CERT members with the quickest and most efficient way to respond to emergency situations. It not only gives the responder better maneuverability in tight spaces, but also makes accessing equipment easier and more efficient. Also, unlike a backpack, this Vest won't fall forward when leaning over to assist a person in need, reducing the risk of injury to yourself or others.